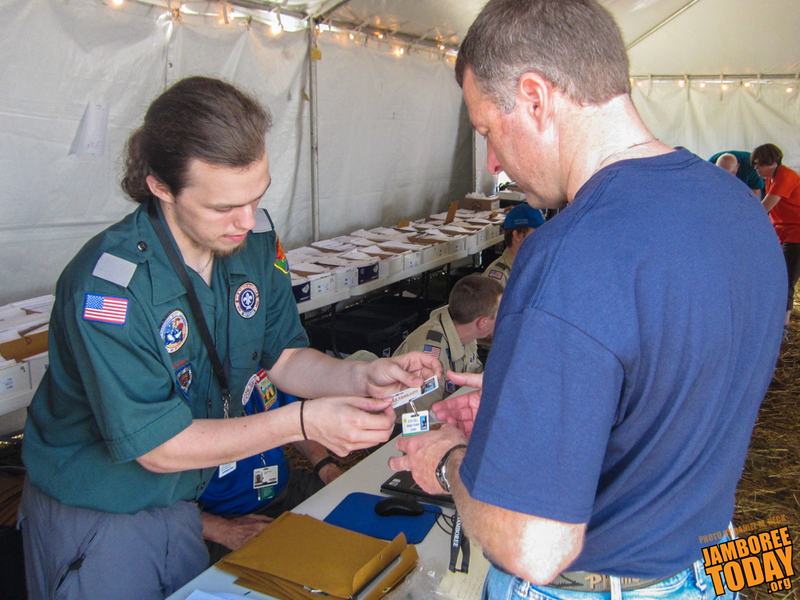 Eagle Scout Robert Spahn from the jamboree registration staff explains the new jamboree credentials to a new arrival. Photo by Daniel M. Reck. For staff members yet to arrive, "be sure you're current for Youth Protection Training for both Boy Scouting [the general course] and for Venturing. Bring printouts of your completion certificates," Helmbrect says. Also, "have copies of your medical forms with you." Helmbrect, who has come to the jamboree from Dallas, Texas, says that the registration team is ready to help staff members who do not have all their necessary documentation. "We have doctors here" to complete medical check ups, he says, "and we can do Youth Protection Training here, but that takes an hour of your time." Only once arriving staff members' documentation is in order will they be issued their credentials and allowed to board the shuttle to the main camp or bring their car to the storage lot. When troops and crews begin arriving on July 15, they should also enjoy a rapid registration process, Helmbrect says. "When the bus comes in, a volunteer will get on board and ask the Scoutmaster a few preliminary questions," he says. "If they have their scouts' papers ready, they should be done in less than a minute." Lunches will then be brought on the bus and a jamboree greeter will step on board to guide the bus to the Scouts' or Venturers' base camp. "The greeter will give advice to the participants and give them some important information about the Summit," Helmbrect says. After unloading at the campsite, the Scoutmaster or Venturing Adviser will go to the subcamp headquarters to complete the registration process. Any corrections to the roster or credentials will be handled there, Helmbrect says. In order to make the registration process so efficient, Helmbrect says representatives from the Boy Scouts of America traveled to the 2011 World Scout Jamboree in Sweden to study how that event managed its 35,000 participants. Helmbrect says that being prepared—and carefully following all pre-arrival instructions—will help everyone get into the Summit more quickly. The first test will be when "we expect 3,100 staff members to arrive just on July 11," he says. Of course, the big day will be July 15, as 30,000 participants will arrive in just a span of hours. The jamboree registration area is located just behind the Days Inn of Mt. Hope located at 127 Ontario Dr., Mt. Hope, W.Va. All jamboree staff and participants must check in here before arriving at the Summit.